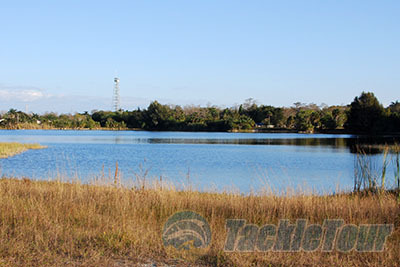 Introduction: In the world of bass fishing, there is always a hot new lure or technique introduced every year that gains heaps of attention. 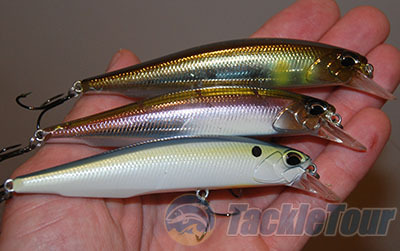 In 2013, the technique of spybaiting caught on throughout the United States, and the Spinbait 80 from Japan-based DUO basked in the limelight. Sure, these minuscule offerings catch tons of fish, but they are not the types of baits you'll find in most anglers' tackle boxes. In contrast, a jerkbait is a very commonly used bait across the country, and it just so happens DUO makes a pretty striking lineup of them! 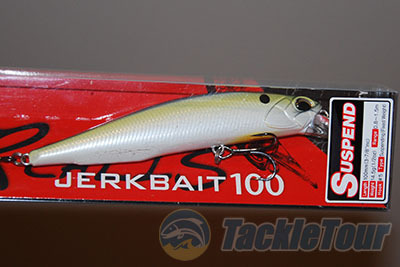 We selected one in particular, the Realis Jerkbait 100SP, to see how it would fare in real-world conditions. Will this scaled down version of the 120SP perform just as well? Impressions: I can sum these baits up in just one word: beautiful. DUO is known for crafting some of the finest baits around, and from a looks standpoint these will not disappoint even the pickiest of anglers. Not only are the colors both vibrant and eye-catching, there are a whopping 16 to choose from. It should be easy to find a color that at least comes close to matching your local prey! 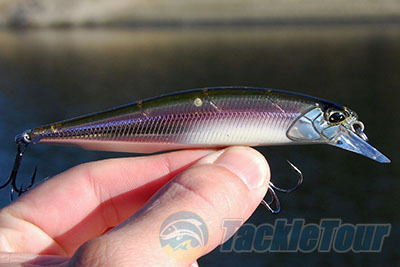 Introducing the Realis Jerkbait 100SP from DUO! The internal setup of the 100SP confused me at first. At the time of this writing, the lure packaging touts a total of nine stainless steel rattles in five separate chambers, while the DUO website indicates nine rattles total in three chambers. Curiously, the description found on TackleWarehouse.com seems to be the one that is actually correct. Using an LED light, I was able to clearly see the internals of my �Half-Mirror Ayu� colored bait and can say with certainty that there are four chambers (three large, one small) that each contain a single stainless ball. Mystery solved! Three out of four balls sit in rather large cavities, thus allowing them to create quite a bit of ruckus. Indeed, the bait is quite noisy not unlike a lip-less crankbait. Other than the rattle chambers there are two flat, fixed weights along the inside of the belly that are said to improve both the startup and quality of the action. The profile is a typical bait fish shape with the only difference being the �Flat Side Body� design which is advertised as increasing flash and water disturbance. 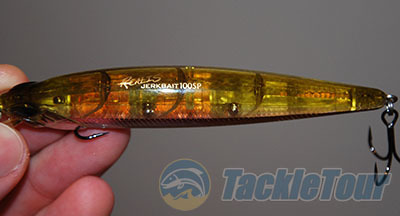 The head of the bait features a sweet design with realistic eyes and a small diving bill that allows it to dive to five feet. Casting: Throwing the 100SP is not an easy task�it's a super easy task! Despite the lack of a weight-transfer system, it casts extremely well regardless of the wind direction. It's very stable as it sails through the air and I never experienced any issues with it tumbling. You have to remember that this is a 1/2 ounce jerkbait so it cuts through the wind well and is able to reach some good distances. With the added heft, a medium-heavy crankbait or jerkbait rod is ideal. I like it quite a bit with a G. Loomis CBR845. Here's a picturesque place to fish the DUO. Retrieve: Something quite eye-opening about the 100SP is the fact that it has very little water resistance. You can burn this thing as fast as you want and never get fatigued or feel the need to go grab a reel with a lower gear ratio. Of course it's not really made to be fished like that, but if you ever find yourself throwing this bait at barracuda in the Florida Keys, you'll be pleased by its ability to be easily reeled at high speeds. Next Section: Rip that bait!